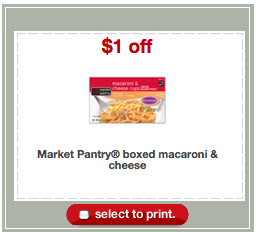 Print a $1/1 Market Pantry Box Mac & Cheese Target coupon while it lasts. Then look for the 2.5-serving boxes at your local Target. They are priced around $0.52 each making them FREE after coupon!